Having sealed their second successive title two weeks ago, there was little pressure on the York club’s final game of the campaign, but they couldn’t resist posting one final victory – their 14th out of 18 this season, just one short of last year’s total. Dunnington’s lower order Kieran Heaphy, Matthew Stephenson and Gareth Lumsdon, all won in straight games. The home side’s No.2 Danny Hockborn was taken to four by Chapel Allerton 2’s Richard Hinds and finished with a personal record of eight out of eight for the season. Julian Tomlinson also won in four against Cameron Ward to complete the 5-0 (20-2) triumph. Second place was up for grabs as Chapel Allerton 1 met Hallamshire in north Leeds and it was the hosts who took it courtesy of a 4-1 (17-4) win. Ever-improving Paul Allen made only his second YPL appearance and got his first win by overcoming Hallamshire’s Sam Davey 3/1 and James Wilkinson – another occasional YPL player – cruised to a three-game win over Jack Smith. Although Lucas Hughes got three points back for the visitors from Sheffield at third string, Chapel A 1’s ever-dependable top two of Welshman Owain Taylor and world No.158 Mark Fuller were both straight-games victors to round off the season in style. Just like last season, Barnsley finished their campaign very strongly, winning five of their last six games to finish in third position, their final flourish a 4-1 (18-7) win at Hull & East Riding. There was an early setback for the South Yorkshire side when No.5 Polly Clark, the 17-year-old who’s coached by former world No.2 Suzanne Horner, went down 3/1 to the hosts’ Paul Norton. It was one-way traffic thereafter though, with world No.22 Millie Tomlinson beating Yousef Forster in four and Tom Bamford winning his eighth YPL game in his last nine by toppling Glyn Saunders. 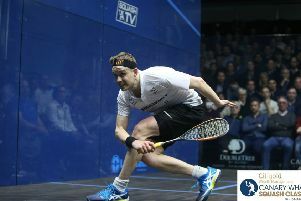 Welshman Elliot Morris-Devred finished the season with a perfect 9/9 record by dispatching youngster Ben Sockett in four and top string Miles Jenkins also signed off with victory, 3/1 over Ben Smith. Abbeydale finished a modest season with a 5-0 (20-3) victory over second-from-bottom Pontefract 2. Brothers Oli and Adam Turner were victors over Billy Hawes and Matt Godson respectively, with Nick Wall Snr and Phil Scully also breezy winners at the bottom of the order. It was left to Jamaican international Lewis Walters to round off the whitewash for the Sheffield club, handing Pontefract 2 top string Adam Taylor his seventh successive YPL defeat.